Mayor Bill de Blasio and NYPD Police Commissioner James O'Neill outlined election day security plans in Times Square on Monday, Nov. 7, 2016. 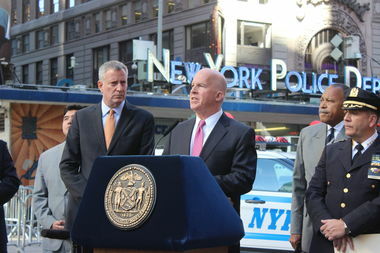 TIMES SQUARE — The NYPD has an unprecedented security plan in place for election day with both presidential candidates in town for the history-making night for the first time in more than 70 years, the mayor and police officials said Monday. The department will deploy more than 5,000 officers to cover the city's more than 1,200 polling sites throughout the day, and protect the candidates — Hillary Clinton at the Jacob Javits Center and Donald Trump at the New York Hilton Hotel — that night, officials said. NYPD Chief of Department Carlos Gomez said the the sheer number off officers involved will be "by far the largest election detail that the NYPD has ever had," on par with the detail deployed for Pope Francis's visit — as well as the annual New Year's Eve celebrations. Gomez said uniformed officers will be at all poll sites, many of which are inside public schools or NYCHA housing, in anticipation of the almost 4.5 million registered voters in New York City. "There will be much the public will see and much the public will not see," Police Commissioner James O'Neill said at a press conference in Times Square Monday morning. O'Neill, Mayor Bill de Blasio and other top NYPD officials repeatedly reminded New Yorkers of the popular "see something, say something" adage. "The phrase 'If you see something, say something' is a very specific idea," de Blasio said. "It's not just words. We all have to help the NYPD." "Tomorrow I want everyone to remember of course that public safety is a shared responsibility," O'Neill added. "If anyone sees something tomorrow that doesn’t look right, doesn’t feel right, let one of our officers know about it. There will be no shortage of uniformed officers around to tell. Or call 911. Remember, that’s what we’re here for. We’re here to keep people safe." Both men pointed to last year's United Nations General Assembly, when more than 170 world leaders, as well as President Barack Obama, were in New York, as evidence of the NYPD's preparedness. "That showed the range and ability of the NYPD," de Blasio said. "You're going to see it again today and tomorrow." De Blasio said the city is prepared not only to protect the candidates and New Yorkers around the city, but to respond to any problems at the polls. "We’re focused on the big stage tomorrow night, but we’re also focused on our poll sites all over the city during the day. We will not allow any form of voter intimidation," he said. "NYPD is ready to step in if we see any evidence of that occurring." Counterterrorism units will be out in full force, with heavy weapons teams from the NYPD's elite Emergency Services Unit at various locations throughout the city. "NYPD supervisors have received instructions and election day protocols," Gomez said, adding that attorneys from the NYPD Legal Bureau will be available to assist as well. The NYPD is also deploying every single one of their explosive-detecting canines, as well as "hundreds of police officers assigned to mobile field forces ready to respond to issues as they arise." There will also be more officers riding the city's subway and bus system, doing fare checks and scanning bags at entrances and exits, and several street closures, particularly in Midtown where the candidates are staying and celebrating. The street where Trump Tower sits at Fifth Avenue between 56th and 57th streets, for instance, will be closed as long as Republican candidate Donald Trump is inside, starting at 6 a.m. Tuesday morning. NYPD Commissioner for Counterrorism John Miller made note of threats from ISIS and Al Qaeda, and said that responding to such threats will entail "what has become normal for New York City," including K-9 units, radiation detection and plainclothes counterterrorism officers "looking for suspicious activity." "We've come to a place where we take these things in stride," Miller said. "We take all threats seriously, but we wouldn't be doing anything differently, and the deployment that's been described is basically what has become normal for New York City."